When you live overseas the most trivial things can make you so, so happy! There is always something that you miss about "the home country" that you just can't seem to find anywhere in your new place of residence. Among expatriates in Bolivia, one of the most missed simple pleasures of life is sour cream! And today (bounce bounce) I found it! I found sour cream in Santa Cruz! (bounce bounce bounce). Now it may sound irrational to some of you (bounce bounce bounce) that someone should get so ecstatic about sour cream... but I haven't had it in four years, and I know of a somewhat large number of expats other than myself who have been sorely disappointed over this, so excuse me for a moment while I bounce off the walls! So expats in Santa Cruz... all I can say is FIDALGA NORTE on Banzer and the third ring, in the LACTEOS aisle next to the milk and yoghurt. 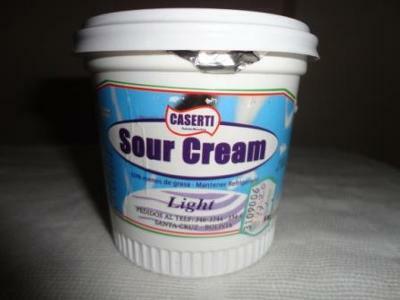 The brand is CASERTI - pictured above. Let's just hope it's not one of those temporary importation things again where we all get totally excited that we finally found something and then we never see it again... if you live here, you know what I mean. Comments for I Found Sour Cream in Santa Cruz, Bolivia! S O U R C R E A M ! Heavy whipping cream comes in blue and white bags that are similar to the leche PIL and can be found right next to them. Crema de leche or leche crema. Great find!! I'll get some today...now how about some cream/heavy whipping cream?